Comedy writers will tell you that crazy people plus a normal situation equals funny and interesting. Sane, normal people plus a crazy situation equals funny and interesting. But crazy plus crazy equals neither funny nor interesting. So it’s rather unfortunate that crazy on top of crazy on top of crazy plus a little more nutso are the kinds of people and situations populating John Guare’s The House of Blue Leaves. Currently being revived on Broadway for no apparent reason, this unfunny and mostly uninteresting play is boring and tedious to sit through, save brief moments here and there. 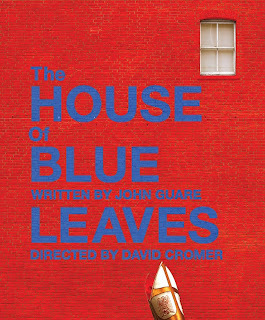 Directed by the acclaimed David Cromer and performed by a talented cast that includes above the title stars Ben Stiller, Edie Falco and Jennifer Jason Leigh, and below the title theatre talents like Alison Pill, Thomas Sadoski and Halley Feiffer, you’d think that The House of Blue Leaves would flourish. Instead, characters are whiney, straight-up bonkers and delusional. The play centers around Artie Shaughnessy (Stiller), a middle aged man who works at a zoo but wants to make it as a musician. His mistress is the star-fu*king Bunny Flingus (Leigh), who lives in the apartment beneath Artie’s and who is always positioning herself as a martyr. (Bunny, or Leigh’s interpretation of Bunny, was the whiniest of the bunch.) Artie is married to Bananas (Falco), who, though certifiable may be the sanest one in the home. It’s October 1965 in Queens and the Pope has come to town to speak at Yankee Stadium. This sets off something in Bunny, and she and Artie see the Pope’s arrival as a sign to get married and start life over in California. Sounds interesting, but it isn’t. None of these people are likable so I couldn’t invest in them; I didn’t care what happened to them. The first act is all Artie, Bunny and Bananas, and it drove me up the wall. Falco, who gives a very good performance amid not very good material, had a blank, bored stare on her face for most of the act. (It’s apropos, as Bananas is so heavily medicated, she doesn’t feel anything. At one point, she actually says to Artie, who is shoving more pills down her throat, “Why won’t you let me have an emotion?” (Diana Goodman, anyone?)) If the audience had been looking at me, they would have seen the same blank, bored stare. Bunny just kept yapping and yapping and name dropping, which is not compelling. The second act was a little better, as the trio from the first act were featured a little less. It was here that we get to know Ronnie (Christopher Abbott), Artie and Bananas’s son. Abbott was charming, in an off-kilter kind of way. His gravity almost made him the straight man in a house full of wacky people. But, he’s a little off his rocker, too, having gone AWOL with several grenades in an attempt to blow up the Pope. Some nuns come into the house, as does Corrinna Stroller (Pill), who is the girlfriend of Artie’s buddy in California, Billy (Sadoski). (We’ll meet him in act three.) About half way through the act, though, Bunny and Artie came back in and drove me right back up that wall. All told, The House of Blue Leaves just doesn’t have any redeeming qualities about it. The performances are good (particularly Falco and Abbott), but the material was not. There is no cleverness to the play; nothing there that successfully appeals to my sympathies; and no characters that are, at least in this production, likable or even complex enough to, despite despicable and reprehensible behavior, be called interesting.